Although the Norman townsite was settled during the Land Run of April 22, 1889, Cleveland County. In fact, if not for the efforts of Norman's early citizens and civic leaders, Norman, Noble, Lexington, and Moore would now be part of Oklahoma County. In 1890, the Fifty-First Congress of the United States began to draft the bill which would provide for a government in the newly settled Unassigned Lands. Early on, the location of county seats was limited to six towns: Oklahoma city, Guthrie, El Reno, Kingfisher, Still, and Beaver (in No Man's Land). 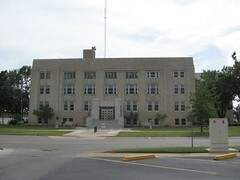 The presence of a district court and courthouse was an asset to any town, and Norman Mayor D.W. Marquart sent several telegrams petitioning the House Committee in Washington: one telegram requested the county seat due to "Norman being centrally located and a town of importance commercially as well as in size and number of inhabitants." The efforts were successful, and on May 2, 1890, President Benjamin Harrison signed the Oklahoma Organic Act, which created the Oklahoma Territory and established Norman as one of the county seats. George W. Steele was nominated by President Harrison to be the First Governor of the Oklahoma Territory and his first official act on May 24, 1890 involved setting boundaries for the new counties. 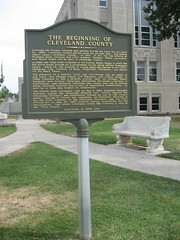 The future Cleveland County was referred to only as the "Third County". The original north boundary of the Third County was located at what is now 59th Street in Oklahoma City: it was moved to 89th Street in 1891. The original east boundary was the Pottawatomie Indian Treaty Line, located near present-day 132nd Ave. SE in Norman: it was later moved six & one-half miles east. Governor Steele called for an election, to be held on August 5, 1890, to choose a permanent name for the Third County. The editor of the Norman Transcript suggested "Little River County", but local political parties had other plans. The Democrats held caucuses on July 26 and chose the name "Mansur County"in honor of Charles Mansur (U.S. Representative, Missouri, 1887-1893) because he had supported the settlement of the Unassigned Lands. Two days later, county Republicans announced their choice of "Lincoln County", in honor of slain President Abraham Lincoln. After hearing the Republican choice. Democrat party leaders called and emergency session to choose a new name. 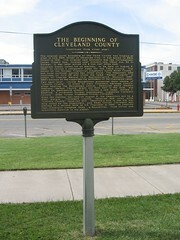 William C. Renfrow, a prominent Norman businessman, suggested "Cleveland County", after former President Grover Cleveland. When the election was held on August 5, the Democrats won by a wide margins: "Cleveland County" received 829 votes while "Lincoln County" receive 405. (Renfrow's role in the win was duly noted by the Democrats, and when Grover Cleveland was elected to a second term as U.S. President in 1893, he removed then-Governor Abraham Seay, a Republican, from office and appointed Renfrow in his place).